There are lots of ad and speed hassles, and not enough locations here. In short, it’s hard to see why you should pick VPN Speed over any of the competition. 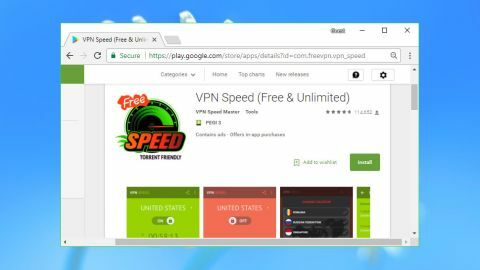 VPN Speed is a torrent-friendly Android VPN app with more than a million installs reported on Google Play. The free service supports only three countries: Netherlands, UK and US. There are ads – lots of ads – and individual sessions will be disconnected after an hour unless you remember to tap a Reset button. VPN Speed doesn't have any bandwidth limit, though. It doesn't require registration either. The developer claims it unblocks Netflix and many other sites (more on that later), and says the service won't log or share your data. You can upgrade to the commercial service to remove the ads and time limits, improve performance and get access to 21 locations around the world. The full list of locations is as follows: Bulgaria, Canada, Czech Republic, France, Germany, Hong Kong, Ireland, Italy, Lithuania, Luxembourg, Latvia, Netherlands, Romania, Russian Federation, Singapore, South Africa, Sweden, Switzerland, Ukraine, as well as the UK and US. That's an interesting selection: it isn’t good if you need Asian locations, but it’s far better than most services for Eastern Europe, and South Africa is another relatively unusual plus. The price is steep, unfortunately, at £11 ($13.75) a month or £5.52 ($6.90) a month over a year. Even a premium VPN like IPVanish would only cost $6.49 (£5.20), and that would give you more locations, many more features, and clients to run the service on all your devices. Understanding who owns and runs a VPN can help you figure out how trustworthy they might be, but that's very difficult here. VPN Speed's Google Play page says the app is offered by VPN Speed Master, but there's no information on who this is, no clear official website for them or the service, and the contact for the developer is a simple Gmail address and a street address in Ukraine. "No Users' logs collected or stored. No Users' data sold out or shared!" Sounds great, in theory, although we've lost count of the number of VPNs which tell you that on the front page, and something entirely different in the small print. How much this really matters is open to question. You don't have to register or hand over any personal details, so there's not much that the service can share. We would still like to have a clear explanation of what is and isn't happening when we connect and use the service, but if you're only using the VPN for simple tasks, like viewing region-blocked YouTube clips, the low-level details might not matter. There are some significant permissions here, but only those necessary to run the service, and we've seen other legitimate VPN apps ask for much more. After an easy installation process, VPN Speed opens with a simple and straightforward interface. Choose a location, tap the Connect button and your connection is protected within a few seconds. Other ads appear at different points in the app, and this can get irritating. We clicked Disconnect, and an ad appeared in the centre of a "Do you want to disconnect?" dialog. It would be easy to tap the ad accidentally, rather than the tiny ‘Cancel’ option at the bottom of the screen. We managed it anyway, but then another full-screen ad appeared and we had to close that. Occasionally a full-screen ad would appear below other windows and we'd run into them later. The app does have some welcome bonus features. A Settings dialog enables choosing between IPsec and OpenVPN protocols, an option you won't always see on mobile apps. And if you want some reassurance that the service really is working, tapping a ‘What Is My IP’ link opens a website to show your current IP address and location. VPN Speed claims it allows you to "browse the web as though you were anywhere in the world." That's a stretch, particularly with just three locations available in the free version, but we tried it anyway. Netflix recognized that we were using a VPN and refused to stream any content, but we were able to bypass protection on YouTube, Comedy Central and BBC iPlayer. Our performance tests* suggest you might have streaming problems regardless, as download speeds on the free plan were a sluggish 0.5-3Mbps across all locations. We tried Opera Free VPN on the same device immediately afterwards and averaged 9Mbps without any problems. Signing up for the Premium plan's free seven-day trial dropped the ads and gave us access to all 21 locations. Would this help improve speeds? Well, to a degree. The UK, US and Netherlands locations seemed more consistent but still delivered around 3Mbps at best. But if you're able to use another server, it's possible to get much more. Luxembourg gave the best results from our UK testing point with download speeds of around 18Mbps, as much as our connection could manage, and even Singapore managed 6Mbps. Whatever plan you're using, VPN Speed does a decent job of protecting your identity from snoopers. We pointed our device at ipleak.net, doileak.com and other privacy testing sites, and the service had correctly shielded our IP and DNS addresses at all times. VPN Speed works at a basic level, but the irritating ads and slow speeds are a problem, and the commercial Premium plan isn't worth the price. You'll be better off with a free product like Opera VPN, or any of the big-name commercial VPNs.